"Zombie" stars that explode like bombs as they die, only to revive by sucking matter out of other stars. According Andy Howell, an astrophysicist at UC Santa Barbara, this isn't the plot for the latest scifi blockbuster,iInstead, it's something that happens every day in the universe. This special category of stars, known as Type Ia supernovae, help to probe the mystery of dark energy, which scientists believe is related to the expansion of the universe. Supernovae are stars that have been observed since 1054 A.D., when an exploding star formed the crab nebula, a supernova remnant. More recently, the discovery of dark energy is one of the most profound findings of the last half-century, according to Howell. Invisible dark energy makes up about three-fourths of the universe. "We only discovered this about 20 years ago by using Type Ia supernovae, thermonuclear supernovae, as standard or ‘calibrated' candles," said Howell. "These stars are tools for measuring dark energy. They're all about the same brightness, so we can use them to figure out distances in the universe." These supernovae are so bright that they shine with the approximate power of a billion suns, noted Howell. He calls Type Ia supernovae "zombie" stars because they're dead, with a core of ash, but they come back to life by sucking matter from a companion star. Over the past 50 years, astrophysicists have discovered that Type Ia supernovae are part of binary systems –– two stars orbiting each other. The one that explodes is a white dwarf star. "That's what our sun will be at the end of its life," he said. "It will have the mass of the sun crammed into the size of the Earth." The white dwarf stars that tend to explode as Type Ia supernovae have approximately the same mass. This was considered a fundamental limit of physics, according to Howell. However, in an article in Nature about five years ago, Howell reported his discovery of stars that go beyond this limit. These previously unknown Type Ia supernovae have more than typical mass before they explode –– a fact that confounds scientists. "One idea is that two white dwarfs could have merged together; the binary system could be two white dwarf stars," Howell proposed. "Then, over time, they spiral into each other and merge. When they merge, they blow up. This may be one way to explain what is going on." Astrophysicists are using Type Ia supernovae to build a map of the history of the universe's expansion. "What we've found is that the universe hasn't been expanding at the same rate," said Howell. "And it hasn't been slowing down as everyone thought it would be, due to gravity. Instead, it has been speeding up. There's a force that counteracts gravity and we don't know what it is. We call it dark energy." The new findings relate to Einstein's concept of the cosmological constant. This is a term he added into his equations to make them valid. However, Einstein did it because he thought the universe was static; he didn't know the universe was expanding. When it was revealed that the universe is expanding, Einstein believed this concept was his biggest blunder. "It turns out that this cosmological constant was actually one of his greatest successes," said Howell. "This is because it's what we need now to explain the data." He said that dark energy is probably a property of space. "Space itself has some energy associated with it," said Howell. "That's what the results seem to indicate, that dark energy is distributed everywhere in space. It looks like it's a property of the vacuum, but we're not completely sure. We're trying to figure out how sure are we of that –– and if we can improve Type Ia supernovae as standard candles we can make our measurements better." Throughout history, people have noticed a few supernovae so bright they could be seen with the naked eye. With telescopes, astronomers have discovered supernovae farther away. "Now we have huge digital cameras on our telescopes, and really big telescopes," said Howell, "We've been able to survey large parts of the sky, regularly. We find supernovae daily." Astronomers have discovered thousands of supernovae in recent years. During his career, Howell has used these powerful telescopes to study supernovae. Currently, besides teaching at UCSB, he is involved in LCOGT's detailed study of supernovae that is aimed at helping to understand dark energy. With this extensive network of observatories, it will be possible to study the night sky continuously. "The next decade holds real promise of making serious progress in the understanding of nearly every aspect of supernovae Ia, from their explosion physics, to their progenitors, to their use as standard candles," writes Howell in Nature Communications. "And with this knowledge may come the key to unlocking the darkest secrets of dark energy." 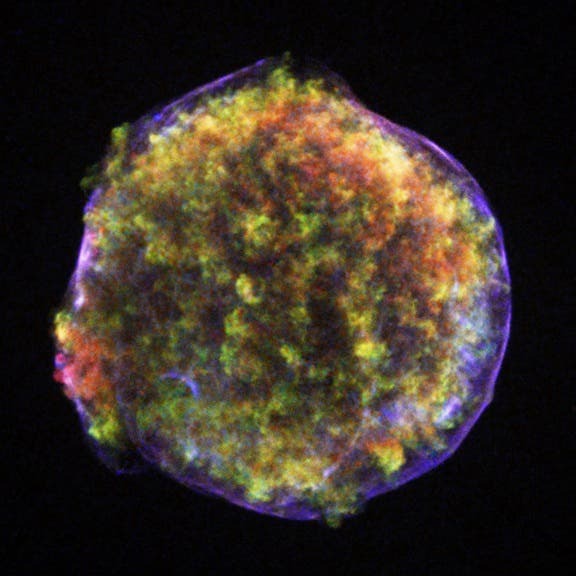 Chandra X-ray image of Tycho's supernova remnant. This Type Ia sueprnova was observed by Tycho Brahe in 1572, and today is just an expanding ball of gas. Astronomers used to have to wait years for a close, bright supernova to learn about them. Today big surveys are discovering supernovae by the thousands. Image below: The supernova is the bright point in the lower-left. It is a type Ia thermonuclear supernova like those described by Howell. 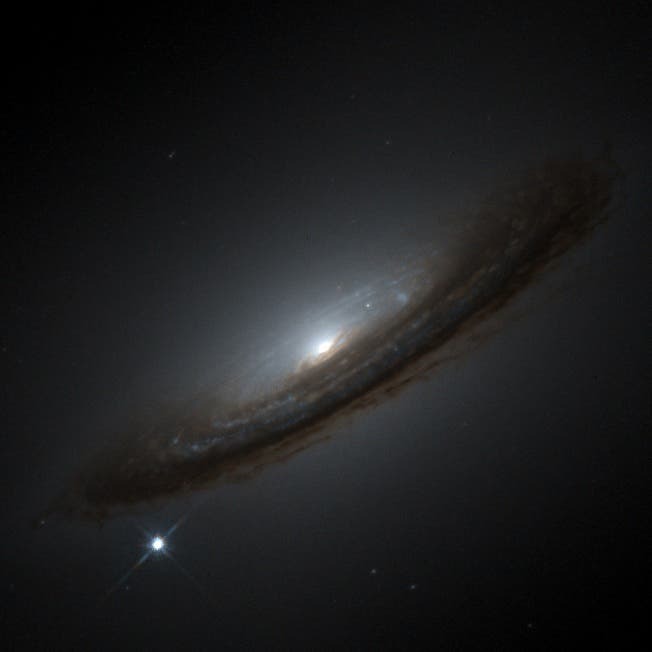 The supernova is on the edge of galaxy NGC 4526, depicted in the center of the image.